Turns out there may be some truth behind this old beauty myth. Is the secret to younger-looking skin as simple as slathering a beloved breakfast dish all over your face? Sure, there's the beauty myth that using egg whites will shrink pores and tighten skin. But there's some truth behind that whole thing about eggs -- and the world of skincare is taking note. For those stopping in their tracks at Perriconeâs $165 price tag, there are other far less expensive options. Thereâs also the petite size and more affordable egg white facial soap from Sweden that costs less than 10 dollars and claims to âdraw out impurities,â resulting in âglowing skinâ if used daily. Also featuring rose water and lanolin, it promises to soften skin and correct redness and dryness. However, for those looking to turn back time, is it really an egg-cellent idea to look for skincare products featuring, well, eggs? Some experts say to think twice before buying into it. 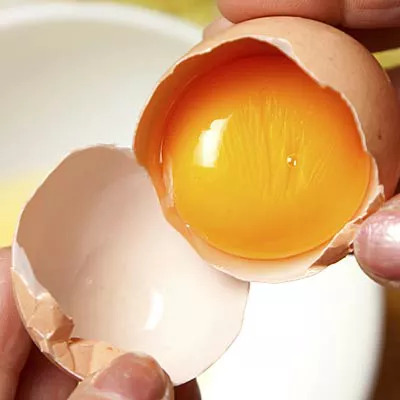 âAlthough egg whites are an excellent source of protein in the diet, their use in skincare has been controversial for years,â says Dr. Elizabeth Tanzi, co-director of the Washington Institute of Dermatologic Laser Surgery in Washington, DC. âIn fact, some find those âegg white facialsâ can actually cause worsening of acne. Itâs important to remember that just because something is ânaturalâ doesnât mean itâs automatically good for the skin." And as for applying it straight from the fridge? Donât even think about it, she insists. âItâs not a good idea because raw eggs can harbor bacteria, which can be detrimental to the skin,â she warns. There's no scientific proof that eggs contribute to youthful skin. âI canât say I am aware of any major studies in the literature exploring topical application of eggshell membrane on collagen formation or inflammation in the skin,â says Dr. Julia Tzu, clinical assistant professor of dermatology from New York University. Tzu also states one could easily avoid an unwanted mess and consult a dermatologist instead, who can prescribe a product for your skin type featuring similar ingredients. Another reason why some are skeptical of the claim? One expert points out that Perriconeâs cream, in particular, include one other anti-aging ingredient. But not all disagree with the concept. Beauty expert Alexis Wolfer of The BeautyBean.com prefers adding eggs to some of her homemade facial masks to tighten fine lines. âEgg yolks, with their fat, cholesterol, and retinols, are also great for helping to reduce the appearance of acne scars, making this ideal for post-pimple skin, too,â says Wolfer in her upcoming book, âThe Recipe for Radiance: Discover Beautyâs Best Kept Secrets in Your Kitchen,â slated to be released in May 2014. And even one dermatologist isnât completely opposed to adding eggs every now and then to your skincare routine. âEgg whites tighten the skin, giving the illusion of smaller pores, but itâs temporary effect,â says Elizabeth McBurney, clinical professor of dermatology at New Orleans-based Tulane University School of Medicine, to Real Simple. So, are eggs a major do or don't? For more permanent results, experts do recommend applying moisturizer daily to hydrate fine lines, as well as maintaining a diet rich in fruits and veggies. However, there's one more beneficial thing you can do for lasting results. âAlthough as a dermatologist, I may sound like a broken record, but the number one thing people can do to minimize the signs of aging is to avoid the sun,â says Tanzi. âWearing sunscreen and a hat to completely keep the face, neck, and chest out of the sun will help so much more than any cream ever will, no matter the price. Still curious? Wolfer shares two of her homemade facial masks recipes including eggs. If youâre wondering whether they will suit your skin, itâs recommended to consult a dermatologist first before application. You can also make a quick change or two to how you apply makeup -- check out a few secrets to melting away the years with makeup in this video. Hydrating + Blemish-Fighting Facial Mask: For dry, combination skin. Whisk the egg to fully combine the yolk and the white before stirring in the honey. Use a pastry brush to apply a thin layer of the mixture to your face, neck, and decollete, avoiding your eye area. Let dry for 20 minutes to tighten pores, tone the skin, and kill bacteria, without drying your skin out. Rinse with warm water and pat dry. Age-Reversing Wine Mask: For all skin types. Whisk all ingredients together until well combined. Use a pastry brush to apply a thin layer to your face, neck, and decollete, avoiding your eye area. Let dry before washing off with warm water and a washcloth. Recipes reprinted with permission from THE RECIPE FOR RADIANCE Â© 2014 by Alexis Wolfer, Running Press, a member of the Perseus Books Group.